Premier Li Keqiang held talks with visiting Malaysian Prime Minister Mahathir Mohamad in Beijing on Monday, saying China will work with Malaysia to promote neighborly friendship to a new high. With new governments established in the two countries this year, the development of bilateral relations was standing at a new starting point, Li said. He said that China will follow the friendly policy towards Malaysia, and will work with Malaysia to score the long-term healthy development of bilateral ties on the basis of mutual respect, equality, and mutual benefit. China and Malaysia have strong economic complementarity and great potential for cooperation. China is willing to better integrate the Belt and Road Initiative with Malaysia's development strategy, while promoting China-Malaysia industrial cooperation and construction of industrial parks, and strengthening cooperation in economy, trade, investment, agriculture, fisheries, and transportation infrastructure, said Li. He said China will import more high-quality Malaysian products to cater to the needs of domestic consumers, improve the level of trade facilitation, and encourage strong and reputable companies of the two countries to expand two-way investment. Li called on the two countries to provide a stable and sound business environment. "China is willing to explore new cooperation with Malaysia in the fields such as science and technology innovation, automobile, finance, and e-commerce," said Li. He also stressed the need to promote cultural exchanges, so as to lay a solid foundation of public support for cooperation. As Malaysia is an important member of the Association of Southeast Asian Nations (ASEAN), the development of China-Malaysia relations will not only benefit the two countries but also help deepen China-ASEAN relations and cooperation, said Li. Against the background of rising unilateralism and protectionism, China is willing to work together with ASEAN countries including Malaysia to advocate multilateralism and free trade, adhere to putting development as a priority, and promote the building of an economic community in East Asia, so as to contribute to regional peace, stability, and prosperity, Li said. Mahathir said that this is the first time he has visited a country outside ASEAN since he assumed office as Malaysian prime minister for the second time but his eighth visit to China as the prime minister. He confirmed that the Malaysian government will continue to pursue the friendly policy toward China and look forward to further consolidating bilateral relations through this visit, realizing mutual benefit and win-win results in the economic and trade fields, and promoting the upgrading of Malaysia-China relations. While calling trade protectionism a historical reversal, Mahathir said Malaysia hopes to export more products to China, welcomes investment from Chinese companies, and hopes that both sides will expand cooperation in tourism, innovation and research and development. Malaysia actively supports the Belt and Road Initiative, which is conducive to promoting inter-connectivity and trade exchanges between countries and enhancing the links between the East and the West, he said. A healthy and stable Malaysia-China relationship will not only benefit Malaysia but also contribute to regional peace, stability, and prosperity, he said. Li and Mahathir also attended the signing of bilateral cooperative documents on economy, trade, agriculture, finance, and technology. When meeting the press after the talks, Li said they agreed that the two countries should be partners in trade and investment, industrial cooperation, and innovation and growth. Li said China will work with Malaysia to build a new pattern of pragmatic cooperation and open up a new space for cooperation in the fields of e-commerce, upgrading of traditional industries, and technological innovation. The two sides also agreed to expand two-way opening up through capacity and industrial cooperation, and promote a more balanced development of bilateral trade on the basis of expanding trade scale. Under the current international situation, the two sides agreed to jointly safeguard free trade, oppose trade protectionism, and promote the healthy development of economic globalization, according to Li. The two sides are committed to promoting the construction of the East Asian Community, supporting ASEAN's central position in regional cooperation, and jointly sending a positive signal to the region and the world of maintaining the long-term friendship and safeguarding regional peace, stability, and development, he added. Mahathir said Malaysia hopes to learn from China's experience and enhance the level of e-commerce and innovation cooperation. The two countries are willing to work together to support globalization and maintain an open, free, and fair international economic system. Also on Monday, the two sides released a joint statement, saying that standing at new historical junctures of their respective national development, China and Malaysia are optimistic about the prospect of their bilateral relations. The statement said that during the visit, leaders of the two countries charted the course for future development of the bilateral relations, and had in-depth exchanges of views on regional and international issues of common interest in a friendly and cordial atmosphere. It said both countries underscored the importance of maintaining peace, security and stability, as well as safety and freedom of navigation in the South China Sea. Both sides emphasized the need for all sovereign states directly concerned to resolve their differences by peaceful means through friendly consultations and negotiations, and the need for all parties to exercise self-restraint in the conduct of activities, and to avoid actions that would complicate or escalate tensions in the South China Sea. China and Malaysia, together with the ASEAN Member States, will work for the full and effective implementation of the Declaration on the Conduct of Parties in the South China Sea and encourage maritime cooperation, as well as actively push forward consultations on a Code of Conduct (COC) to see early conclusion of an effective COC, the statement said. mr.bean, bluewater2012, taxiya and 1 other person like this. India has offered China connectivity through its northeastern region to Bangladesh's Chittagong port on the Indian Ocean as part of an ambitious multilateral plan that appears to complement the Bangladesh, China, India, Myanmar (BCIM) Economic Corridor proposed under Beijing's Belt and Road Initiative (BRI). New Delhi has also invited for the first time "limited Chinese investment" as it sets out to establish a Bangladesh, Bhutan, India and Nepal (BBIN) sub-regional hub linking the landlocked northeastern region with other neighboring countries, the Press Trust of India (PTI) reported earlier this month, in the clearest sign yet of a strategic shift in New Delhi's position on BRI. India has so far refused to participate in the BRI saying that its flagship China-Pakistan Economic Corridor (CPEC) project passes through the disputed territory of Kashmir and therefore violates New Delhi's sovereignty. As BRI marks five years since it was officially announced by Chinese President Xi Jinping in 2013, India appears to be recalibrating its position, with analysts saying New Delhi might be open to infrastructure and connectivity projects under multilateral frameworks (including those under SCO and BRICS) and the recently mooted China-India Plus model of cooperation while formally sticking to its official stand of opposing the initiative. In recent months, particularly after the Wuhan meeting between Xi and Indian Prime Minister Narendra Modi, New Delhi has reportedly warmed up to several BRI related projects including a rail link connecting Afghanistan with Central Asia and China; a corridor linking China, Nepal and India; and the BCIM economic corridor. The latest proposal will connect the Bangladeshi port city of Chittagong with Agartala, the capital city of India's northeastern Tripura state. The plan appears to complement the BCIM corridor, which was formally proposed in 1999 and was incorporated within the BRI framework later. The corridor aims to connect the Chinese city of Kunming with the Indian city of Kolkata through Dhaka in Bangladesh and Mandalay in Myanmar. According to a PTI report, the latest Indian plan was conceived after a ministerial delegation from the northeastern states of Assam, Tripura and Nagaland led by Ram Madhav, a senior leader from the ruling Bharatiya Janata Party (BJP), visited the southern Chinese city of Guangzhou and held talks with both Chinese and Indian businessmen. Madhav said that India has invited China to use India's northeastern corridor to access the Indian Ocean. "[Previously] we had only thought about providing China access to the Indian Ocean through the bordering state of Sikkim and the port in Kolkata. But the Chittagong port is also an excellent opportunity." India's other corridors in sync with BRI? Many analysts say that in addition to its opposition to CPEC, New Delhi's concerns about BRI stems from its anxiety over China's outreach in the Indian Ocean and neighboring countries in South Asia. "India is not opposed to infrastructure development in the region, but it is concerned about the strategic implications of certain Chinese-led initiative," Darshana M Baruah, associate director and senior research analyst at Carnegie India stated in a recently published report. "Connectivity is increasingly seen as a tool for exerting foreign policy influence," Baruah wrote, adding: "This view is reflected at the highest levels of diplomacy by countries like India, Japan and the United States that have issued strong remarks about connectivity and infrastructure." In this context, India's participation in two major multilateral corridor projects - the International North-South Transport Corridor (INSTC) involving Iran, Russian and the Central Asian countries; and the maritime Asia-Africa Growth Corridor (AAGC) jointly proposed by India and Japan - are seen by many analysts as potential rivals to China's BRI. However other observers argue that with the emergence of a multi-polar world order, of which both China and India are major proponents, the corridors could eventually become more complementary to BRI than its direct rivals. The NSTC for instance is a perfect economic complement to the BRI's China-Central-West Asia Corridor (CCWAC), according to Sreejith Nair of the New Delhi-based Institute of Peace and Conflict Studies. The CCWAC runs horizontally (east-west) across Asia from western China to Turkey, while the INSTC runs vertically across the continent from Mumbai to Moscow via Iran, making them complementary, reasoned Nair in a piece for Eurasia Review. "Once interconnected, the two initiatives can boost intra-regional connectivity leading to a unified energy market in Asia, allowing for energy price rationalization... Greater regional connectivity pushes the bargaining power more in the buyers' favor - enabling lower prices - which are certainly in India's (and China's) economic interests," he elucidated. Similarly, the AAGC maritime corridor could also be seen as a legitimate India-Japan partnership to better integrate the economies of South, Southeast, and East Asia with Oceania and Africa, without necessarily competing with BRI's Maritime Silk Road which also operates in the Indian Ocean. With momentum building up gradually towards China-India partnership on connectivity and infrastructure projects, it will indeed be interesting to see if the dragon and the elephant could dance together and herald the Asian Century. Unsurprisingly these students can only learn the Mongolian scripts in China, not in Mongolia (Cyrillic based). Although on the state level, Mongolia should be treated as just another country, but on the individual level, Mongolians on both sides of the boarder are brothers, Mongols and many Chinese ethnic groups in the north (Han, Manchu, Uyghurs etc.) are connected by blood over hundreds of years of intermarriage, for that sake, it only feels natural to help. Equation, bluewater2012 and Hendrik_2000 like this. When Yuuga Utsugi first entered a Chinese store, nobody shouted 'hello!' 'good morning!' or "Irasshaimase!" "But in Japan a lot of people say greetings," said the Japanese young man who is a university freshman. The loud silence felt odd, Utsugi said. But he's getting used to it. 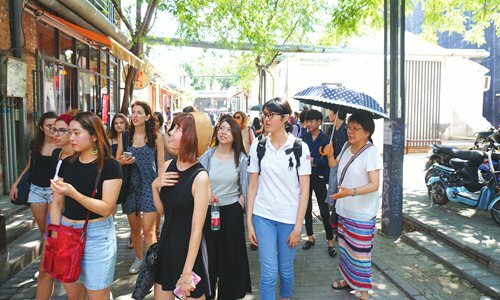 Utsugi is just one member of a group of Bunkyo Gakuin University students participating in a one-month study tour of Beijing. Metropolitan interviewed students and teachers from the coeducational university located in Bunkyo, near the University of Tokyo to glean their first impressions of China. Then we chatted with assistants at Beijing Languge and Culture University about the Japanese students. This year marks the 40th anniversary of the establishment of a peace and friendship treaty between China and Japan. Although the two peoples share some obvious similarities of history and culture, war and politics have long stood as barriers between them. There are actually many more differences - big and small - than outsiders usually realize. Beijing's air pollution seems to trouble Utsugi, but it seems like he didn't want to be impolite. There was "a little" on the first day he arrived in China, Utsugi said. "But now I've got used to it!" he smiled. Chinese people are kind, Utsugi said. He knows because he often plays basketball with strangers on campus and finds it is easy to get along with them. "At first I thought Chinese people aren't polite," said Mayu Yoshinaga, "but Chinese are very friendly, maybe more friendly than some Japanese." What left the deepest impression on Yoshinaga is campus life where she made friends from different countries by communicating in English, Chinese and Korean. She finds Chinese the most difficult, especially the pronunciation. Before she came to Beijing, Yoshinaga worried about the air pollution, "but now I don't think that's a problem. The pollution isn't that serious here." In Japan, the news about China "often gave us a negative image," Yoshinaga said. Some Japanese people have a bad impression of the Chinese "because the Japanese media often say Chinese people are rude," said Fumito Tamamoto. Tamamoto is the only Japanese interviewee to have been to China before. "I have a good impression of China and Chinese people because when I went to Chengdu (Sichuan Province), Chinese people were very kind to me. It was very exciting." The Great Wall impressed Tamamoto. "I wanted to go to the Great Wall to learn more about history. I like Chinese history and some video games include Chinese history," he said. Tamamoto said he knew many Chinese loved Japanese culture and Japanese anime. Anime figures like Kumamon, Crayon Shin-chan, and Chibi Maruko-chan were what came to mind first about Japan, "as well as a few brands like Uniqlo and Shiseido," said Cui Yingwei, a postgraduate student at Beijing Languge and Culture University. Cui worked as a study and life assistant for the Japanese visitors. Cui told Metropolitan she knew little about Japan or Japanese before they arrived. 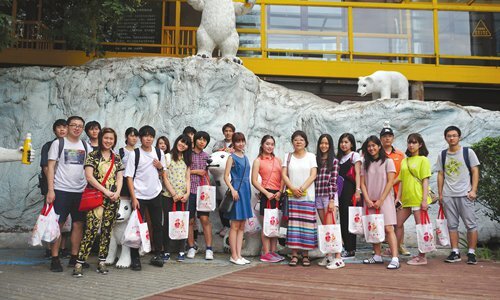 After a few weeks accompanying Japanese students, Cui noticed, "They are very polite, kind and hardworking. Every time after I tutored them or came back from off-campus tours, they expressed their gratitude." "They never speak loudly in public spaces." In Cui's considered opinion, "Japanese people care a lot about details and made-in-Japan products are practical and simple." Wang Yuzhou, another assistant, agreed that the Japanese "have a serious work attitude." "The reason why so many Chinese rushed to buy a Japanese toilet lid a while back was also due to the fact that Japanese products are very well-made," Wang said. It is obvious that Shuntaro Namura is not a big fan of Beijing traffic. "In Japan, the horn is only used in an emergency, but some Chinese people use the horn so often." Nana Yahagi finds the traffic tricky for a different reason. "The traffic jams are very heavy and the bicycle riders run too fast that I got scared." For her, Chinese food is "very oily, so sometimes my stomach gets tired." Hiromi Horage, chief of the international programs office at the university's Hongo campus, loves listening to students complaining, praising and communicating. The university started the project in 2002. 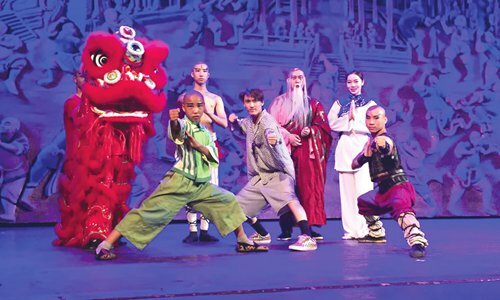 "In the beginning it was only a short-term program during summer vacation, which mainly focused on Chinese-language study," Horage told Metropolitan. In 2013 they introduced English language classes and added a few off-campus social activities. 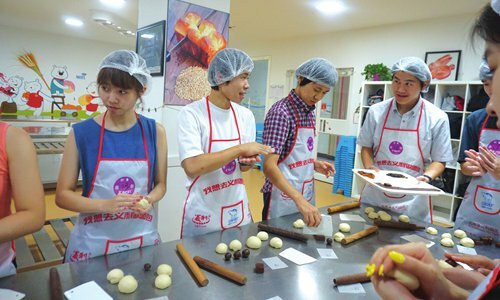 The social activities included visits to Beijing landmarks, a local court hearing and visits to some State-owned Chinese companies. It's only a month of study, Horage said. 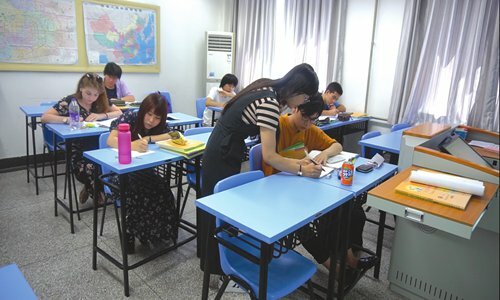 "Maybe there won't be much achievement on the foreign language front, but they can learn a lot about Chinese culture, experience local life and see things not covered by the Japanese media with their own eyes. This is the major goal of this project." By exposing Japanese students to an alien environment, it helped them understand English better. "The communication with Chinese students also provides access to Chinese students' opinions on China-Japan relations and history, which cannot be learnt in textbooks," Horage said. bluewater2012, Equation and duncanidaho like this. 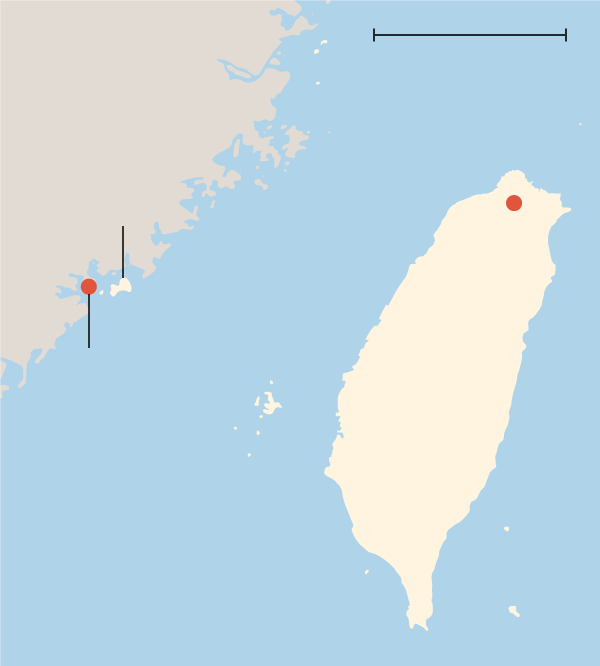 Taiwan — The islands of Kinmen County, and the Nationalist troops stationed there, withstood artillery shelling from China long after the Communist victory in the Chinese civil war. Today, relations between China and Kinmen, just miles apart, are very different indeed. Kinmen, about twice the size of Manhattan, has been governed from Taiwan since the defeated Nationalists fled China for the islands in 1949. But Taiwan’s main island is 140 miles away, while China looms visibly in the near distance. That distance is narrowing — both literally and figuratively. A new airport for the Chinese city of Xiamen is being built just north of Kinmen, on an island three miles away, and land reclamation for that project will bring Chinese territory almost a mile closer. began supplying Kinmen with drinking water through a new 10-mile pipeline. And Kinmen will probably soon get cheaper electricity from its onetime enemy. Liu Jieyi, the director of Beijing’s Taiwan Affairs Office, used his speech at the ceremony on the island to demand that self-governing, democratic Taiwan accept the “One China” policy, which declares that Taiwan and China are part of the same country. “The vast populace of Taiwan will certainly make the correct choice,” Mr. Liu said. He almost certainly wouldn’t have made such a speech on Taiwan’s main island, where suspicion of China runs high. When Mr. Liu’s predecessor toured Taiwan in 2014, he was met with protests in multiple cities and his car was splashed with paint. Wang Ting-yu, a Taiwanese lawmaker with the Democratic Progressive Party, said the freedom and democracy enjoyed in Kinmen made it unlikely that its residents would want to be part of authoritarian China. But he said China’s ruling Communist Party had had some success on the island with so-called United Front tactics, under which it works with non-Communist groups to achieve its goals. Chen Fu-hai, the magistrate of Kinmen County, who shared the stage with Mr. Liu at the pipeline ceremony, said he wasn’t concerned that the water supply would give China political leverage. “I think China and Taiwan should have more interaction,” he said in an interview. The new pipeline will provide Kinmen with 30 percent of its tap water, making up for strains on water supplies from growing Chinese tourism, environmental factors and the two sorghum liquor distilleries that provide most of the county’s tax revenue. On a recent hot afternoon at Kinmen’s Tianpo Reservoir, where the pipeline from China empties, Hong Yanming, a Kinmen resident, called the new water connection a “joyous occasion for both sides of the Taiwan Strait.” She was taking photos with friends and family visiting from China. Lesser Kinmen, was shelled sporadically by China from the 1950s through the late 1970s. It was heavily militarizedand cut off even from mainland Taiwan until 1992, when martial law on Kinmen ended — five years later than in the rest of Taiwan — and residents participated in their first local elections. Kinmen, unlike mainland Taiwan, did not spend half a century as a Japanese colony; it was a Chinese territory for most of that time. Such stark differences in their experiences, as well as the distance between the islands, have made the relationship awkward. Tourists visiting Kinmen from mainland Taiwan might find it odd to hear a resident speak of “going to Taiwan” for school or work, implying that Kinmen isn’t part of Taiwan. Many Kinmenese say they’ve been abandoned by Taipei, Taiwan’s capital, since the arrival of democracy. Mr. Chen, an independent politician who is Kinmen’s first elected magistrate not to be a member of the Nationalists, or Kuomintang, said none of Taiwan’s elected presidents had paid enough attention to the county’s needs. Economically, he said, Kinmen has largely had to fend for itself since then, relying primarily on sorghum liquor sales and, more recently, Chinese tourism. Ferry services to mainland China began in 2001, and Kinmen’s view of its giant neighbor has been softening since then. Lauren Dickey, a researcher at King’s College London who specializes in Beijing-Taiwan relations, said China’s pull on Kinmen was only natural. “If the local government on Kinmen is not finding the central government in Taipei to be meeting its needs, then it is perhaps only logical that the Kinmen government would reach out to the geographically closest resources to ensure needs are met,” she said. In the shadow of Xiamen’s urban buzz, much of Kinmen’s population has been hollowed out, with young people opting to move to the Taiwanese mainland or to China. Most of its photogenic traditional villages are only about one-third occupied, with many of the old courtyard homes in disrepair. Some young people who have stayed say the political climate has changed. Wang Ting-chi returned to Kinmen after six years in New York and founded a company, Local Methodology, to provide a nongovernmental platform for promoting Kinmen culture. She said she was concerned that Kinmenese felt like “orphans” because of the distance from Taiwan’s main island, and that they might be tempted by overtures from an increasingly powerful China. People who express concerns about Chinese influence, Ms. Wang said, are often dismissed as naïve. “I think Kinmen is going off on its own to establish relations with China,” she said. Belt and Road (B&R) initiative. The deal comes at a time when Myanmar faces tremendous economic hardship at home and mounting global pressure over ethnic conflicts in the country. The CMEC offers an ideal solution for the Southeast Asian nation to weather the daunting challenges and points to the growing popularity of China's win-win, no-strings-attached cooperation model under the B&R, analysts noted on Wednesday. Chinese and Myanmese officials on Sunday officially signed a memorandum of understanding (MoU) on the joint construction of the CMEC, according to a statement from China's National Development and Reform Commission (NDRC). Following the signing of the MoU, Chinese and Myanmese officials, led by NDRC Vice Chairman Ning Jizhe and Myanmese Minister of Planning and Finance U Soe Win, held talks on Tuesday on the implementation of the CMEC. The two sides agreed to form working groups focusing on 12 different areas, including development planning, investment, transportation, energy and border economic cooperation zones, according to a statement from the NDRC. While details of the CMEC, including specific projects and investments, were not immediately disclosed, analysts said that the signing marks progress toward strengthened economic ties between the two neighbors. "By signing the MoU on the CMEC, Myanmar has fully embraced the B&R in seeking help from China to deal with its domestic economic challenges and the rising global pressure," said Zhu Zhenming, a professor at the Yunnan Academy of Social Sciences. "And this opens the door for more cooperation between China and Myanmar." Zhu pointed out that while the CMEC will yield long-term benefits for Myanmar, it will also ease short-term difficulties, as the country is facing growing pressure both at home and abroad. "Domestically, the Myanmese economy is growing very slowly because of the lack of investment. Globally, there has been talk of sanctions against Myanmar over the Rohingya issue. So more than ever, the country needs China," he said, noting that China should give Myanmar "more leeway" in cooperation deals. First proposed by China during Chinese Foreign Minister Wang Yi's visit to Myanmar in November 2017, the CMEC aims to link Southwest China's Yunnan Province to Myanmar's Mandalay, Yangon and Kyaukphyu regions. Chen Fengying, a research fellow at the China Institutes of Contemporary International Relations in Beijing, said that following the signing of the MoU, there will be a lot of investments and projects that will bring tangible benefits for Myanmar. "Like many countries in Southeast Asia, Myanmar needs a lot of investment for its social and economic development. So I think the CMEC will focus on helping Myanmar in that regard," Chen told the Global Times on Wednesday. Energy is also a key area of cooperation between China and Myanmar. The two countries have already begun building pipelines for oil and natural gas. 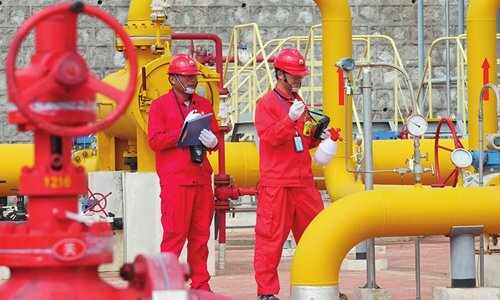 A new pipeline that would connect the current China-Myanmar pipeline to Southwest China's Sichuan Province is expected to open by the year's end, according to media reports. "All cooperation is based on mutually beneficial principles as China has stressed under the B&R. I think that is why Myanmar, despite the noises from the West about the B&R, chose to sign the CMEC," Zhu said. At the China-Myanmar border, there is village that is half-Chinese and half-Myanmar. The side on Chinese territory is called Yinjing, and the side on the Myanmar territory is called Mangxiu. Villagers in the two countries speak the same language and share the same customs. As part of its Belt and Road Initiative, China is building cross-border economic zones like this with Myanmar, Vietnam, Russia and works are also underway for one with North Korea. What is life like for foreign workers and residents living in these special zones? bluewater2012, Equation, duncanidaho and 1 other person like this. A massive monument depicting four Chinese figures wheeling a large circular object, determined faces pointed directly south, stands in the Chinese border town of Jiegao opposite Muse in Myanmar. While the motto would seem to speak for the ambitions of China’s Belt and Road Initiative (BRI), a US$1 trillion dollar global infrastructure-spending program first articulated by President Xi Jinping in 2013, the statue at Jiegao was actually erected 20 years earlier in 1993. The idea of opening a trade outlet for China’s landlocked southwestern provinces through Myanmar to the Indian Ocean was first articulated by Pan Qi, a former vice minister of communications, in an article for the official weekly Beijing Review in September 1985. But logistics, civil war and, most importantly, military suspicion of China’s ambitions all conspired against the corridor’s realization – though border trade took off in the early 1990s, just as Western sanctions on the then military regime’s rights abuses started to pinch. The CMEC is envisioned as a 1,700 kilometer-long corridor of roads and railroads connecting the Chinese city of Kunming, the capital of China’s southern Yunnan province, with three Myanmar commercial centers, namely Mandalay, Yangon and the Kyaukpyu port and economic zone that lets out on the Indian Ocean. It appears that China is doubling down on its push for the CMES as progress on the China-Thailand railroad that envisions connecting China with mainland Southeast Asia through Laos appears to be stalling. China has already constructed oil and gas pipelines that run the length of Myanmar into southwestern China. It is not likely the CMEC-enabling MoU was even on the Myanmar government’s agenda a couple of years ago, a time when Myanmar’s relations with the West were riding high amid optimism for the country’s move to democracy and ties with China at a countervailing low point. While Suu Kyi’s National League for Democracy (NLD)-led government seems more willing to engage China’s BRI ambitions, it is still unclear how far Myanmar’s military and other political leaders are willing to play along with Beijing. Recent history shows at times strong military resistance to China-led projects, particularly those perceived as a threat to national sovereignty. In 2011, then president Thein Sein, a former military general, suspended a US$3.6 billion China-backed hydroelectric power project at Myitsone in the country’s northern Kachin state. That project was slated to export 90% of the power produced to China and threatened to significantly disrupt the flow of the nation’s main Irrawaddy River. More tellingly, perhaps, Thein Sein also allowed a May 2011 MoU to build a high-speed railroad from the Chinese city of Ruili, near Jiegao, to Kyaukpyu on Myanmar’s western coast to expire in 2014. In a sign of the changed times and shift in foreign relations under Suu Kyi, the daily Myanmar Times reported back in July this year that the railroad project that expired under Thein Sein is “quietly back on track” under Suu Kyi’s government. He portrayed the railroad as a “win-win deal” that would not become a “debt trap”, as many big ticket BRI infrastructure projects in the region are now being portrayed, including in Sri Lanka, Pakistan and Laos. His and other criticism led to a downsizing of the project in August to a more manageable US$1.3 billion for the port. In October 2017, China’s CITIC Group and its subsidiaries had already agreed to drop its stake in the project from 85% to 70% amid Myanmar fears of becoming too dependent on its powerful northern neighbor. Still, the BRI writing is on the wall in Myanmar. There will be a huge deep-sea port built at Kyaukpyu – and, most likely, a high-speed railroad connecting it will Ruili in Yunnan – both with Chinese majority stakes. The exact financial terms of the projects are either still being worked out or have not yet been publicly disclosed. Suu Kyi’s civilian government clearly wants to show it has accelerated economic development since its election in late 2015 and before new polls are held in 2020. Many in Myanmar had earlier hoped that the transition to semi-democracy would spark a foreign investment-led economic boom, but that hasn’t – and now likely won’t – happen with rising Western criticism of the Rohingya crisis. The previous Thein Sein government, under which both the Myitsone dam and initial plan to build a China-Myanmar high-speed railroad were scrapped, was dominated by the pro-military Union Solidarity and Development Party (USDP), the NLD’s main electoral rival at the next 2020 polls. The USDP’s “reform program”, under which political prisoners were released and a more open political climate replaced the old rigid dictatorship, also aimed to lessen the country’s economic dependence on China through improved relations with the West. It is unclear what steps the highly autonomous military might take if it feels that the NLD government is ceding too much to China, but it certainly has several leverage points to thwart any move in that direction, including a strong military presence along various sections of the proposed corridor. What is clear is that China is forging ahead again with its 25-year-old vision to push south, strategically at a time when Myanmar is once again estranged and isolated from the West.